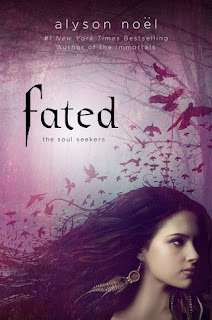 Fated is the first book I read by Alyson Noel. I did know that a lot of people enjoyed reading her books, but I started reading with no expectations whatsoever. As I started, the beginning was very interesting. I noticed that a lot of people said they couldn't get into the story because of the beginning, but I found that part to be one of the most interesting parts of the whole story. Daire Santos, the main protagonist of this story, had had strange things happening to her laterly. She has "visions" or "hallucinations" of crows following her, and glowing people and other animals. Her mom was very worried about her, because no medicine seemed to help. Therefore, she gets sent to live with her grandmother in New Mexico. The mother of her dead father she never met, until now. I enjoyed reading about Daire, because she isn't one of those annoying protagonists who you might cross paths with sometimes. I liked her character, and she reminds me of myself sometimes *wink wink*. I loved seeing how her relationship with her grandmother evolved, and how she also made an awesome new friend. Also, just as I was hoping that there would be parts of her going to school, she gets enrolled in the public school. I loved the twists of the book, and how there is pretty much a mix of everything. Like the usual young adult, there is a gorgeous male lead. Dace, who has an "evil" twin brother, crosses paths with Daire one day at school. While she is instantly remembers him from her dream, she is also mesmerized by his beautiful blue eyes. I'm not going to get into what happens, because I don't want to spoil anything, but let's just say that Dace was not your typical "bad boy" character. While I enjoyed most of the things in the story, I'm going to have to admit that I felt confused at some parts. I just couldn't imagine what was happening, and rarely I would get lost as well. Overall, Fated was a very enjoyable book to read. I recommend to all you young adult readers, because it is an awesome book that will not disappoint. Even though I had to read it at times when I wasn't studying for my exams, I did enjoy those hours. I am very excited to find what happens next in the second book of the Soul Seekers series. Sounds good! I have the cute yellow version of this, it's sitting on my shelf, waiting to be read! I'm mexican, but you can use the translator for read in english haha. Noel's newest release combines passion, danger, and Native American mysticism into one fun read. Daire Santos leaves behind her glamorous life as the daughter of a Hollywood make-up artist to move to small town Enchantment, New Mexico with the grandmother she's never met. Only, turns out those visions she's been having? Yeah, those visions are real, and she must learn to embrace the heritage she never knew existed. Daire is a very realistic heroine. She has her flaws like anyone, but unlike many heroines out there in YA lit today, Noel gives Daire a self-awareness that really comes across the page. Furthermore,the supporting cast is simply great! And Daire's love interest, Dace, is honestly a nice guy--something a little rare in the bad-boy littered YA world.